Although chlorine bleach is known for its whitening properties, it contains chemicals that may produce pale yellow stains on objects. 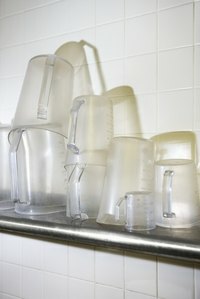 Plastic surfaces, such as serving bowls and acrylic bathtubs, are susceptible to yellow streaks when exposed to chlorine bleach for extended periods. Failure to promptly and thoroughly rinse bleach off plastic, such as during cleaning, is commonly responsible for the discoloration. Promptly get yellow bleach stains out of plastic to restore its appearance. Put on rubber cleaning gloves before addressing the yellow bleach stains. Open nearby windows and turn on fans to supply additional ventilation in the area. Pour 4 ounces of hydrogen peroxide into a spray bottle. Spray the bleach-stained plastic with the hydrogen peroxide, thoroughly saturating the yellow discoloration. Let the hydrogen peroxide permeate the bleach stains for 10 minutes. Scrub the saturated bleach stains with a nylon scrub brush. Remove as much discoloration from the plastic surface as possible. Moisten a cleaning rag with water. Wipe the hydrogen peroxide off the plastic, thoroughly rinsing the surface. Inspect the plastic surface for lingering bleach stains. If the yellow discoloration persists, spray the stains with a commercial calcium, lime and rust remover product. Scrub the remaining bleach stains off the plastic using a pumice stone. Dampen another rag with water. Wipe the calcium, lime and rust remover from the plastic, thoroughly rinsing the surface. Commercial calcium, lime and rust remover products contain caustic acids. Abrasive scrubbing materials scratch plastic surfaces.